Jasper Fforde's fifth book and the first one not to feature Thursday Next. 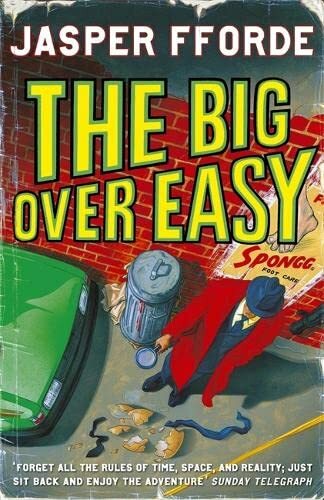 In 'The Big Over Easy', DI Jack Spratt investigates the demise of Humpty Dumpty. Did he fall or was he pushed? Two-thirds of the way through, I wasn't sure how good it was, but in the end it was really great ending to a excellent book. Updated 12 July: On its way to nice-cup-of-tea after spotting it on her wishlist. The book arrived today for a short visit in Germany. Thanks to nice-cup-of-tea for borrowing me the book! I just finished "The Big Over Easy". It was a good book. But sometimes it was hard for me to read and to understand it. That only because of a little cold. I shouldn't read books in English when I'm ill. :-) So I acctually didn't get all puns and jokes of the book. Maybe also because I hardly knew some englisch-spoken nursery rhymes. Beside that I still enjoyed the book very much. Tomorrow I will send it back to nice-cup-of-tea. Received back in the post from mirani - will go back on the top of my TBR pile! What a briliant book! Fforde is a genius :-) I loved the fact that this book is set in Reading (I couldn't shake the feeling that you could see this as the town off the M4 or you could see the word as the act of reading!) and i recognised lots of the places, having lived in Reading for a while! It's hard to explain the plot, but basically a rollicking good detective story, with a few twists to the tale. A fantastic backdrop of nursery rhyme characters, anthomorphic animals and just lots of jokes and word plays. I noticed passing references to Monty Python and Dan Brown amongst others. As with all Fforde books, I think it demands several re-reads to get all the jokes! Thanks Gothmarcus. I will send this out on a ring when my life is a little bit more in order! spotted on nice-cup-of-tea's book mountain and kindly lent to me - thanks! Am currently reading through the Thursday Next Series, right now I'm at the third one. So it'll take me a while before starting on "The big over easy". But I was so happy to discover that Fforde has written more books, even as I'm sceptical if there any good without Thursday in it... well here's my chance to find out. Thanks so much for lending ncot, will find it's way back to you at the next opportunity. Back on my bookshelf, thanks sunbeetle! Book re-read in preparation for reading "The 4th Bear"! The Big Over Easy is still excellent! Ist im bärigen Stübchen eingetroffen und zu behändigen. I devoured this book in one big gulp- a truly exellent read! I will return it soon to the Cafe Gloria for the next lucky person to find..
Ps. Special greetings to the predecessor who made the epic journey from Gmünd to Göpfritz and left his ticket behind as a bookmark.